This year, I wanted to make my own gift wrap to go along with my handcrafted holiday gifts, so with Christmas fast approaching, I decided it was time to get started. 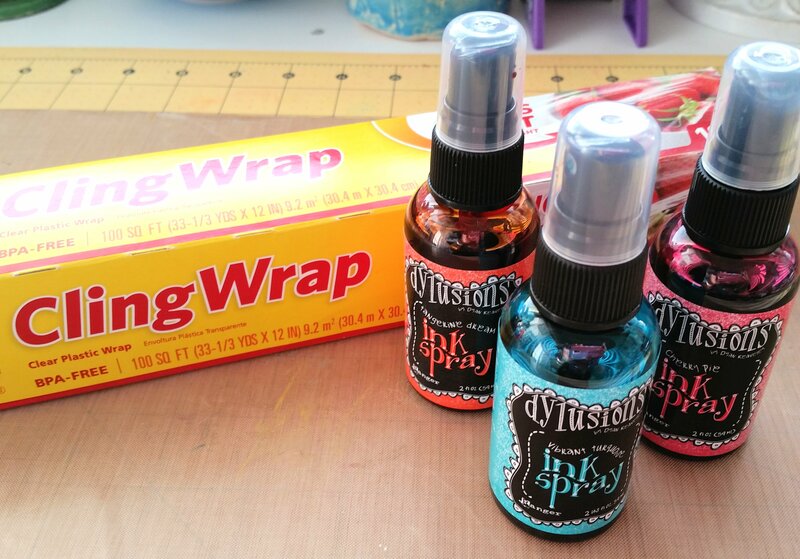 You can use this same process to make wrapping paper, but I needed gift bags, so that’s what I’ll share with you here. When I have the time, I like to carve my own stamps, but you can use any stamps that you have on hand. For this project I carved some holly then used a pencil eraser dipped in red paint for the berries. I started by putting a few dabs of acrylic paint onto my gelli plate. I’m not a huge fan of traditional Christmas red & green, but use whichever colors that you like. 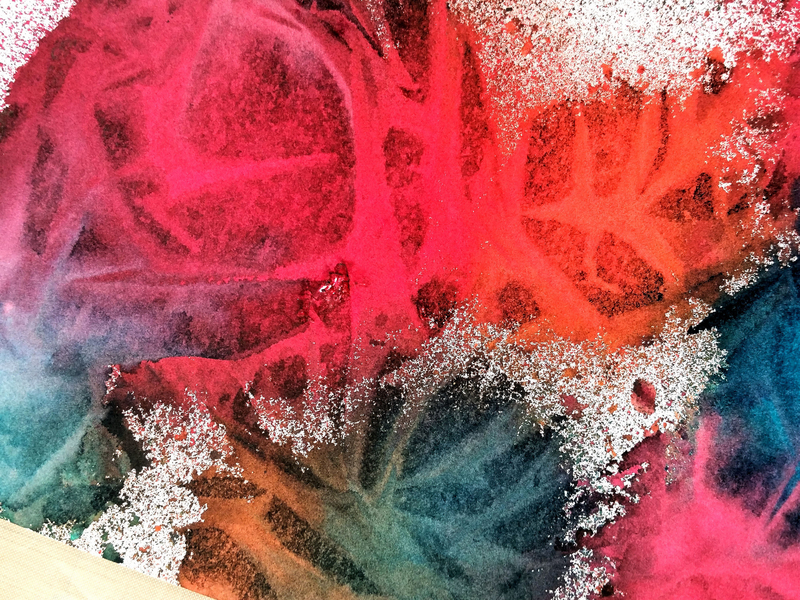 Using a brayer, roll your paint out, covering your gelli plate. Next come the fun part…mark making. You can use stencils, or any number of mark making items that you can find around your house. You can get as elaborate as you’d like here and if you have the time, build up layers. For this bag I used a silicone pot holder, pressing it randomly over my plate, creating marks in the wet paint. I placed a plain white lunch bag on top and burnished it with my hand. 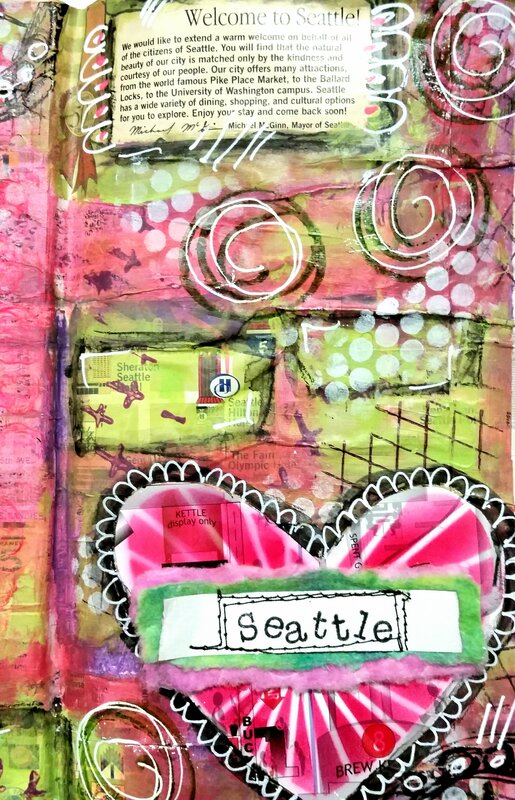 Depending on the size of your gelli plate, you may have to work in sections to cover your bag. I have an 8×10 plate, so there is about an inch at the top of the bag that doesn’t get printed. You can either pick up your bag and press it down in an area of your plate that still has paint or leave it. In my case, that part of the bag will get folded over and no one will see it, so I left it. 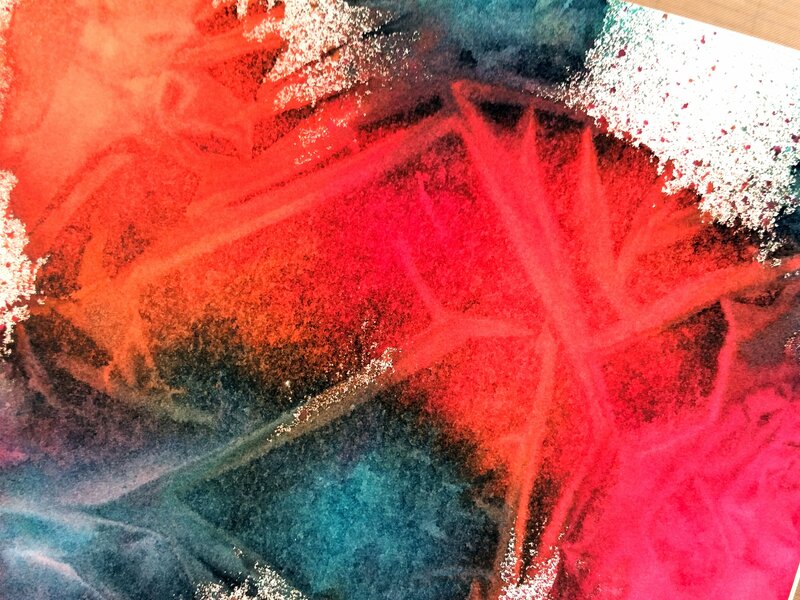 Since you’re using a thin layer of paint on your gelli plate, the bag will be pretty much dry by the time you print both sides, but if you need to, hit it with a heat gun for a few seconds. Next, I took another of my own hand carved stamps and did a little stamping around the edges of the bag. Using a couple of my favorite white pens I added some dots & doodles to brighten it up a bit. I stamped my holly on a piece of white cardstock, added some berries and cut it out. Using my Tim Holtz Tiny Attacher, I stapled the holly to the corner of my bag for a little extra holiday cheer. Here is another bag that I made, using my gelli plate, a texture stamp by Darkroom Door, and a hand carved circle stamp created by me. If you don’t have a gelli plate, you can still create unique gift bags using the same white lunch bags and any stamps that you have on hand. Add a couple of sheets of tissue paper and you’re done. In just a few short minutes you can make unique, handcrafted bag for gifts and baked goods that let the recipient know just how much they mean to you. I go through quite a few baby wipes when I’m getting my art on, but I try to minimize some of my wastefulness by recycling them into my art projects and happy mail that I send out. Just a couple of days ago I used some wipes that I had already used to clean up Dylusions spray inks, spritzed them with a bit more color and let them dry. 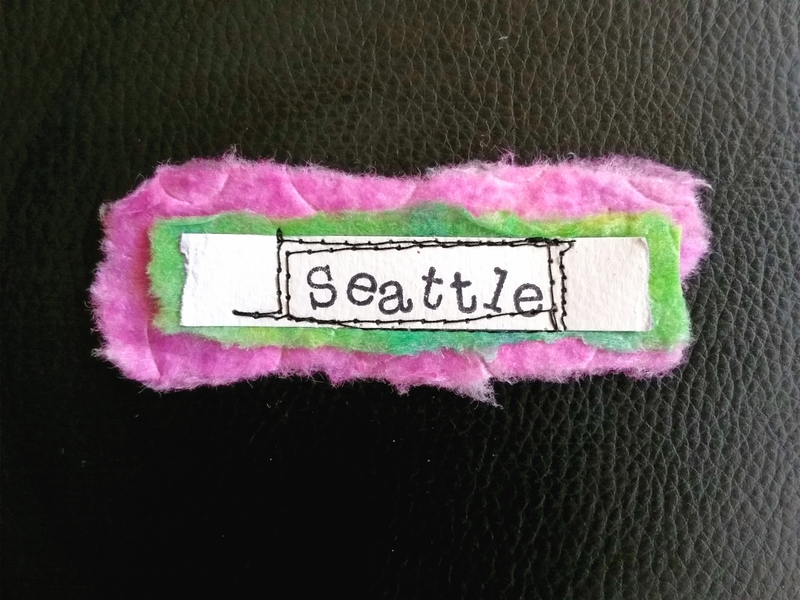 When my colorful baby wipes dried, I tore off a couple of strips, added a strip of paper that I had stamped some lettering on and stitched the edges using my sewing machine. Voilà: instant tag. And here’s the new tag in action. I added it to my a recent DLP challenge where we had to incorporate a map. You can recycle used baby wipes for various things such as adding extra texture to your mixed media projects, both over and under paint / gesso, sew them together to make a banner, or spritz them with more color as I did HERE, then tear them into pieces and add to your layouts for extra visual interest. There are likely many more uses for these little trash can treasures. If you have other crafty uses, please share, we’d love to hear from you! I love alcohol inks for the vibrancy of color that they yield and Ranger’s Dyan Reaveley’s “Dylusions” are at the very top of my list of favorites. They’re a fast and easy way to create eye-catching backgrounds with concentrated colors that really pop. That being said, you do have to give some thought as to what you’re going to do with your background once it’s done. Alcohol inks are water based so they react differently to the various wet mediums and while spraying water over them gives them an amazing blendable quality, we don’t always want our colors to run; just something to keep in mind. You’ll find many videos and methods for sealing Dylusions available on the interweb, so play around, find which gives you the results you’re looking for. My personal preference, if I’m going to be layering paint or other wet mediums, is to spray my dry background with a couple of coats of a fine mist sealer or fixative, letting it dry then adding a layer of clear gesso over it. Ok, so let’s get on with making pretty stuff, shall we? 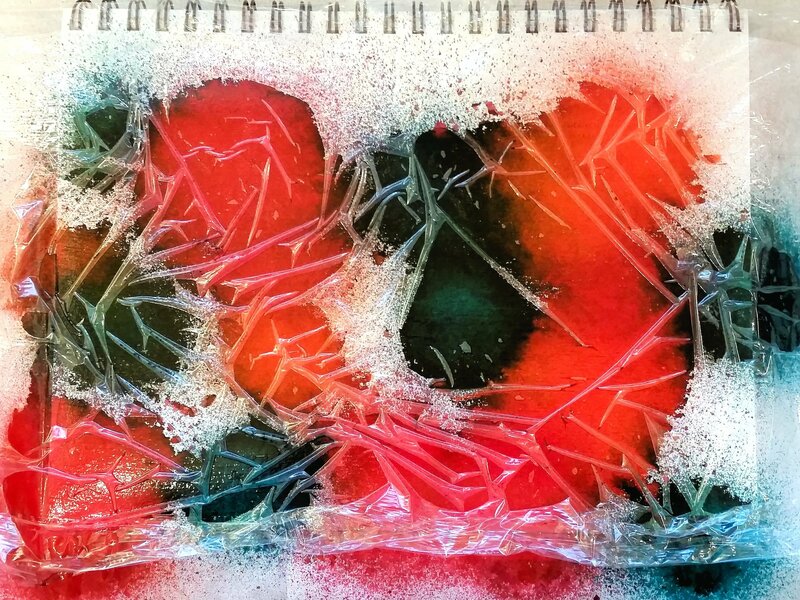 I created this background using Dylusions Ink Sprays and plastic cling wrap from our kitchen. I first protected my work surface, which I recommend if you don’t want overspray everywhere, and liberally sprayed my substrate with ink. For this particular background I used Tangerine Dream, Vibrant Turquoise and Cherry Pie. When the inks were nice and pooled on my page I covered it with a sheet of plastic cling wrap, making sure that I cut it a bit larger than my journal page, and moved it around with my fingers, creating folds. The folds will create the texture, so don’t be afraid to really move that plastic wrap around. Next, I let it dry. I’m not the most patient of people, so I sometimes do this part before I go to bed and by the time I wake up it’s ready to go. This morning, however, I didn’t make my page as wet as I sometimes do so it didn’t take too long to dry. Once dry, I peeled off the layer of cling wrap and ta–da, vibrant background with fantastic texture and movement created by the folds in the cling wrap. Just look at all the yummy colors created by the 3 colors blending; this is exactly what I love about Dylusions ink sprays! 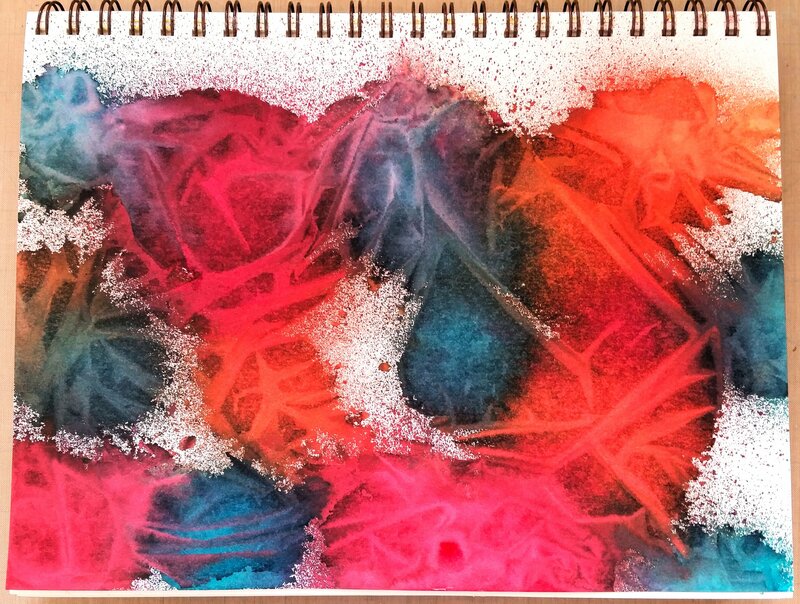 Play around and have fun creating your own backgrounds, just remember to seal your pages if you’re going to be layering other wet mediums over them.